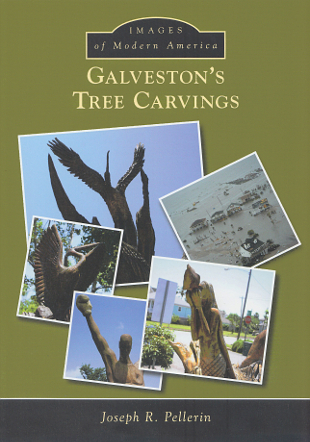 Saturday, May 30th, 3:00 – 5:00 p.m.
Galveston Bookshop will host a book signing on Saturday, May 30th from 3:00 to 5:00 PM for Joseph R. Pellerin and his new book on the tree carvings that sprung up all over the island after Ike. The storm surge of 2008’s Hurricane Ike left thousands of mature island trees poisoned by salt water. Galveston’s Tree Carvings tells the story of how many of the stumps were preserved and sculpted into art pieces in a kind of homage to the stately glory of the magnificent specimens that were lost. The book is full of color photographs of the sculptures and historical details of the properties on which they stand. Born in Galveston to 2nd generation BOI parents, Joseph R. Pellerin teaches history at San Jacinto College and operates the local sight seeing company, Historic Galveston Tours.